Talk about instant gratification. According to an August 8 paper in Cell Reports, injecting a fragment of the protein klotho markedly improves memory and motor function in mice. Klotho is a protein associated with cognitive function in people, and reported to slow aging and boost cognition in mice. The shot apparently worked in both young and old animals after a few hours or days, even in mice overexpressing α-synuclein, according to scientists led by Dena Dubal, University of California, San Francisco. Curiously, the treatment reportedly was effective even though it didn’t cross into the brain, raising the question of whether peripheral signals can modulate cognitive function on a short timescale. “It's one more step toward proving that klotho is correlated with cognitive improvement,” said Carmela Abraham, Boston University School of Medicine. Abraham was first to show lower klotho levels in the aging brain, and to suggest that increasing its levels could be beneficial in Alzheimer’s disease (Duce et al., 2008). She cautioned that researchers will have to work out the mechanism, and that the result needs to be reproduced. “These new results are fascinating. With the clear need for more effective treatments in neurological diseases, we should embrace novel targets and strategies,” wrote Jonas Mengel-From, University of Southern Denmark, Odense, to Alzforum. The klotho protein gets cleaved from the plasma membrane by ADAM 10 and ADAM17 to circulate as a hormone (Dec 2007 conference news). It regulates signaling pathways involving insulin, Wnt, and fibroblast growth factor. Klotho recently gained wide attention because of its lifespan-extending benefits in people and mice that express higher levels or variants (Kurosu et al., 2005; Arking et al., 2002). As notable—and mysterious—is an apparent brain-boosting power in mice and association with better cognitive function in humans (May 2014 news on Dubal et al., 2014; Yokoyama et al., 2016). Dubal and colleagues, including Abraham, had previously reported that overexpressing klotho could overcome learning and memory deficits in mice that also overexpress human amyloid precursor protein (APP) (Dubal et al., 2015). However, klotho expression was artificially elevated from birth. “The burning question in the field is whether klotho has therapeutic potential,” said Dubal. That is, could it improve function in a shorter time frame? To find out, first author Julio Leon and colleagues intraperitoneally injected a long fragment of the klotho protein called αKL-F into young mice. The fragment is nearly identical to the one released when klotho is cleaved from the membrane. Immunoprecipitation studies confirmed that αKL-F did not cross the blood-brain barrier or change endogenous brain levels of klotho. Even so, after four daily injections, the peptide improved both learning and memory retention as measured in the Morris water maze. Mice treated with αKL-F found their target platform faster and spent more time in the target quadrant than mice treated with vehicle (see image above). The same mice, tested two weeks after the last injection on a Y-maze, preferred to explore an arm they hadn’t yet seen, suggesting there might be a longer-lasting effect on synapses that benefited spatial and working memory. Working memory also improved in a Y-maze four hours after a single shot. Naïve, young mice treated with αKL-F were more likely to explore an unfamiliar arm of the maze than those treated with vehicle. Injection with the human αKL-F equivalent did not improve performance. The αKL-F treatment appeared to work in older mice. At 18 months, animals were injected once and tested on a Y-maze the next day. Once again, they preferred to explore the new arm, suggesting they remembered the familiar one. Mice receiving vehicle showed no preference. Lastly, the researchers tested mice that overexpressed the α-synuclein protein and developed memory and motor deficits as α-synuclein builds up in neurons and synapses (Rockenstein et al., 2002). 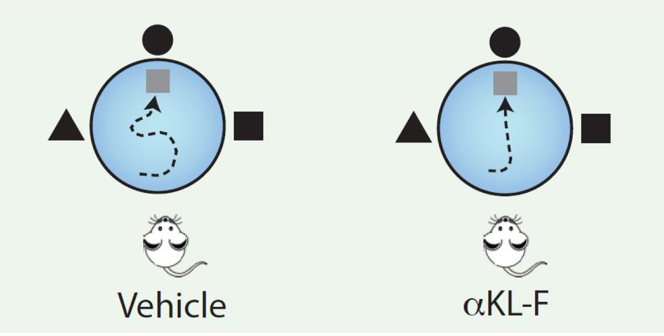 Two days of klotho fragment injections left levels of α-synuclein the same, but treated mice stayed perched on a fixed or rotating cylinder longer than those injected with vehicle. They also preferred to explore an unfamiliar arm of a Y-maze, suggesting both motor performance and memory got a boost. In collaboration with Abraham and the Lennart Mucke lab at the Gladstone Institute of Neurological Disease in San Francisco, Dubal reported in 2014 that klotho overexpression raises the number of GluN2B subunits of NMDA receptors in synapses. These subunits transmit long-lasting signals, enhancing synaptic plasticity. While short-term klotho treatment left GluN2B levels unchanged four hours after injection, it did raise the number of subunits that had been cleaved by calpain, which activates them. According to experiments in acute hippocampal slices from treated mice, αKL-F strengthened long-term potentiation (LTP), a form of synaptic plasticity. However, blocking GluN2B channels abolished any benefits of the peptide. “Klotho may be shoring up the synapse, which is a target of degeneration in dementias and in aging,” said Dubal. Abraham noted that it has proven difficult to consistently manufacture large amounts of the klotho protein, possibly due to improper folding or aberrant enzymatic activity. “A small molecule that would increase klotho levels is likely to be more cost-effective and easier to manufacture,” she told Alzforum. Mengel-From cautioned that klotho affects many different pathways. Researchers have learned in recent decades that hormone replacement has complex risks and benefits that depend on clinical and demographic factors, he said.